I have lived in a 1920’s semi-detached property situated approximately 4 miles from Bristol city centre and ¾ mile from the River Avon as the crow (or should I say swift!) flies. The local area is surrounded by many parks and open spaces including the famous Clifton and Durdham Downs. I first became aware that swifts were nesting in my house in May 2005. Whilst I was painting the front bedroom windows one flew over my head and “disappeared” under a raised roof tile. From that day I wanted to find out as much as possible about these remarkable birds. 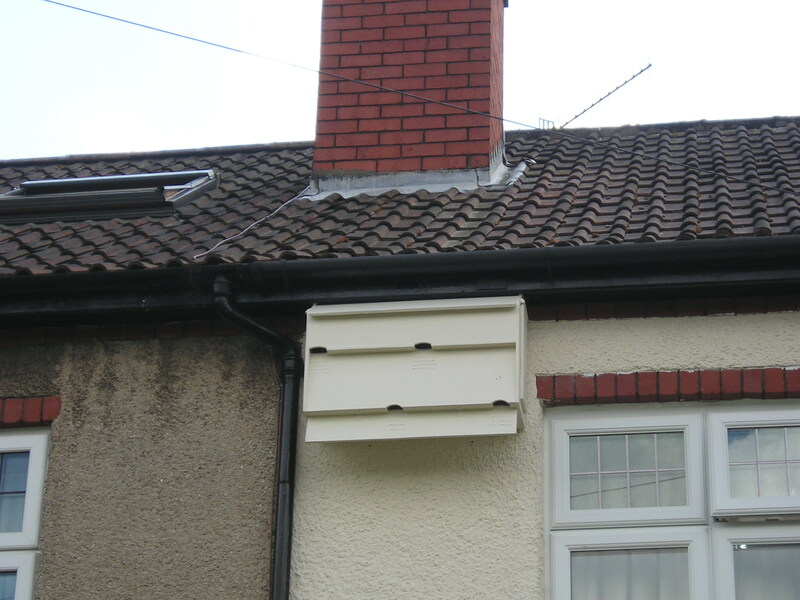 Back in those days information about swifts on the internet was very basic indeed, and my first nest box designs were rudimentary to say the least. They looked like long brown shoe-boxes with a large side entrance. 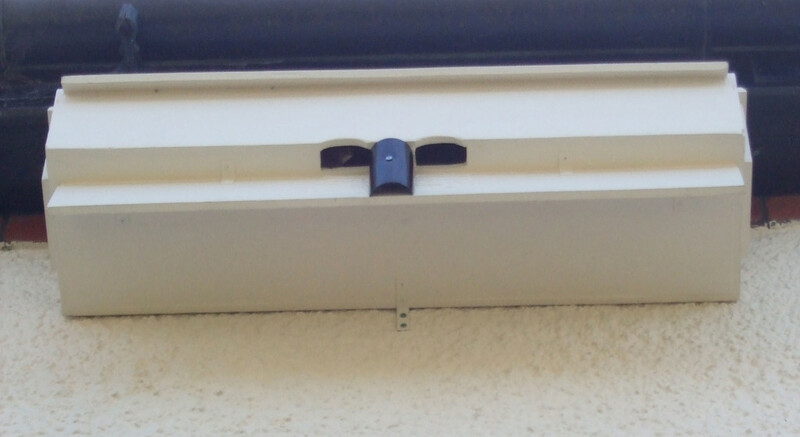 I installed them in a row under the soffit above the garage which gave them only a 3 metre drop. Needless to say they weren’t very successful. 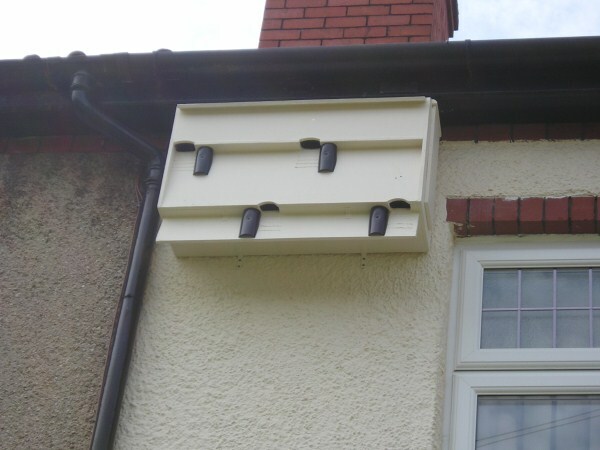 By 2006 as more information became available on the Internet I had changed my nest box design, the first of many alterations to come. I also painted them the same colour as the house purely for aesthetic reasons. By this time I had also acquired the Swift Calls CD which I played continuously in the summer. My original pair returned to their nest under the roof tiles in late April. Throughout the summer despite playing the CD on a daily basis I was unable to attract any newcomers into my boxes which now numbered 14. The same routine continued for the next three years. The original pair would return each spring and I would play the CD as loud and as often as I could (trying not to annoy the neighbours!). This did attract small groups of non-breeders from time to time, but for some unknown reason I couldn’t get them to go anywhere near my boxes. By May 2010 and after the arrival of my original pair, the design of my boxes had changed once again. They were now a mixture of all shapes and sizes, each with a ribbed landing strip under the entrance hole. It was during June I had a flash of inspiration. I was watching a new pair prospecting around one of my drain-pipes and completely ignoring my boxes (as they normally did). These newcomers seemed intent on trying to squeeze in behind the drain-pipe where it joined the gutter. They seemed to be looking for a non-existent entrance hole behind the drainpipe, when frustratingly my nest boxes were so close. 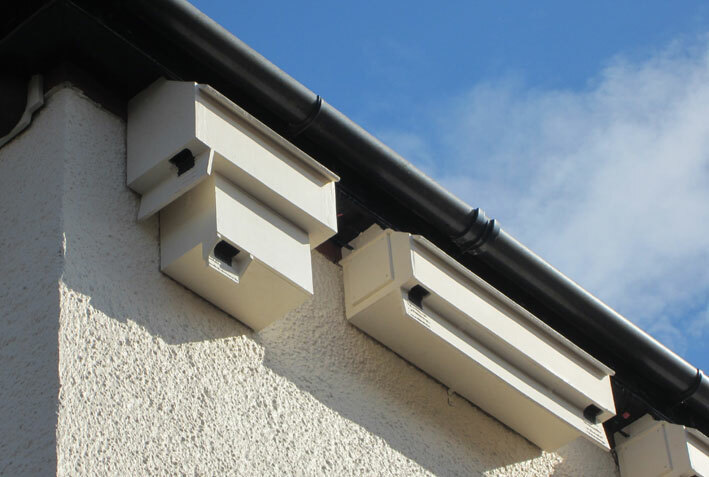 If it was drainpipe that they wanted then I decided to add them to my nest boxes! I fitted small 80mm sections of black plastic pipe adjacent to each entrance hole on every box. This worked almost immediately and within a couple of days I had 2 new pairs taking up residence. By the time they left in early August they had both built two perfect small nests. 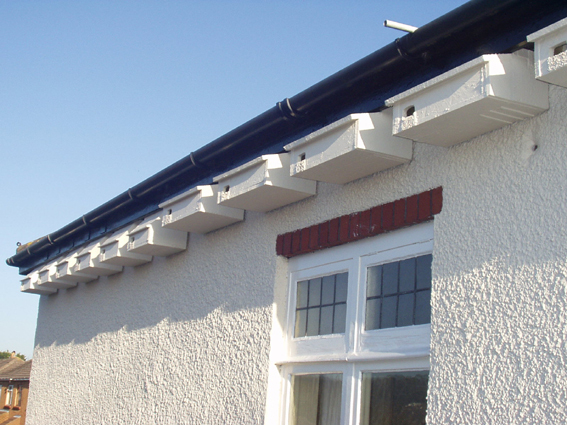 In 2011 I removed the sections of drainpipe on each box and painted the landing strip black, directly beneath each entrance hole, before the 3 pairs returned to breed. They were joined by a new pair of non-breeders in June, taking the colony number up to 4 pairs. Over the winter I had installed cameras in all of my boxes, so I was able to record their activities in even more detail. Below is a photo of my designs in 2011. In 2012 only 3 out of the 4 pairs breeding pairs returned in May, however they were joined by a pair of non-breeders pair in June. This meant the colony remained the same size with 4 pairs. In 2013 all 4 pairs returned in May and were unexpectedly joined by another breeding pair in early June making 5 breeding pairs in total. They were joined in July by another 2 non-breeding pairs, making 7 pairs in total (5 breeding pairs, 2 non-breeding pairs). 6 of the pairs were in nest boxes and 1 pair were under the roof tile. In 2014 all 7 pairs returned in May raising 14 chicks successfully between them, the last fledging on August 6th. This year the colony expanded to 8 pairs with the arrival in July of a non-breeding pair who started building a nest for next year. In April 2015 I installed three newly designed Zeist style nest boxes, two facing west and one facing south. One of the boxes on the west side was successful and was occupied by a pair of non-breeders in early June. The other two boxes remained unoccupied. I noticed the swifts using the box on the west side preferred to fly straight in, without landing momentarily on the landing strip as they do on my other boxes. I therefore removed the landing strips and also changed the shape of the entrance hole – see below. In 2015 14 swifts out of 16 from our colony returned. These were joined by 3 newcomers, a pair and a single bird making 17 in total. The single bird left after a few weeks making the colony size 16 adults – 7 breeding pairs and 1 non breeding pair. 1 adult was predated in July reducing the colony to 15. The 6 breeding pairs in boxes produced 14 chicks of which 13 fledged successfully. The remaining pair under the roof tiles also produced some chicks, numbers unknown, but estimate either 2 or 3. In early April 2016 I put up all my boxes again and now had 17 boxes in total dotted around the house. I repositioned the only south facing Zeist box to the west side of the house, mainly because it was so difficult to maintain where it was. I also managed to add one of my shoe-box design boxes to trial. Although it is primarily designed to fit under large soffits (over 8″ deep) it fits snugly underneath one of my existing boxes on the west side. Overall 2016 has been a bit of a topsy-turvy year. By the end of May all 8 pairs were back in their boxes. These were joined by 2 new pairs in early June making the total 10 pairs. Unfortunately in early July I lost a complete pair, back down to 9 pairs. To make matters worse this pair had 3 chicks. One chick died but I managed to foster the other two into my other boxes and both fledged successfully. In mid-July I gained another pair, back up to 10 pairs. So although the colony has increased in size the performance of 2016 was much worse than 2015. The biggest differences were in eggs rejected and chick fatalities, probably caused by the poor weather in May and June. For 2017 I made 2 new corner boxes (photos on Swift Nest Box Design page). 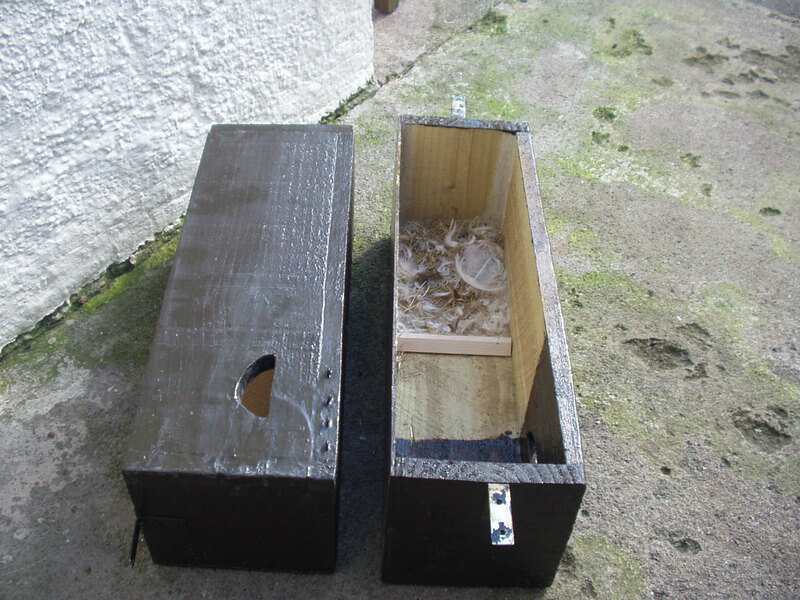 One will replace my shoe box design (shown in photo above) and fits under nest box 5 north. The other will fit under nest box 4 south. I also painted their interiors black along with the interior of my single Zeist box. Three boxes of similar size and design were left unpainted as a control. I wanted to test if swifts prefer dark interiors over light ones (details on the Swift Nest Box Design page). Here’s a brief summary of whats happened during 2017. They arrived late, over a week later than normal. The first one back arrived on May 1st. Over the next 3 weeks nearly all of last years birds joined it. However one noticeable absence was my roof tile pair, they’ve been with me since 2005. A huge loss to me, they were the reason I got hooked on swifts in the first place. I really do miss them. By the end of May, 17 out of 20 birds had returned and breeding commenced. We had a wife swapping male, who left its mate for another and the attack of the honeybees in June, which sadly resulted in the death of 3 chicks. However to counter this we had 5 new pairs arrive, so despite those setbacks the colony grew in size to 14 pairs, a new record. 11 of the 14 pairs bred (another record) and between them they produced 20 fledglings, another new record for the colony. Both new corner boxes were occupied and the trial of painting the interiors black proved very successful as all 3 boxes were used. When the last swift left in August it’s signalled the end of an extraordinary year, a record-breaking year in fact. By early April 2018 all 25 boxes were up. I’d painted the interiors of the 11 remaining unoccupied ones black as I think it makes a real difference when trying to encourage swifts to take up permanent residence. A couple of weeks later on the April 20th the first swift arrived back, the earliest date one has ever returned home. Overall 2018 was a super season, no doubt helped by the exceptional summer weather. We had spectacular activity around the house virtually everyday from mid-May to the end of July. The number of breeding pairs increased from 11 in 2017 to 15 in 2018. They produced a record number of fledglings 29, that’s 9 more than last years total. However there is still plenty of room at Swift House to fill, so roll on 2019 – I can’t wait! These are my swift breeding charts for 2011, 2012, 2013, 2014, 2015, 2016, 2017 and 2018. Here is a link to our current nest box location. 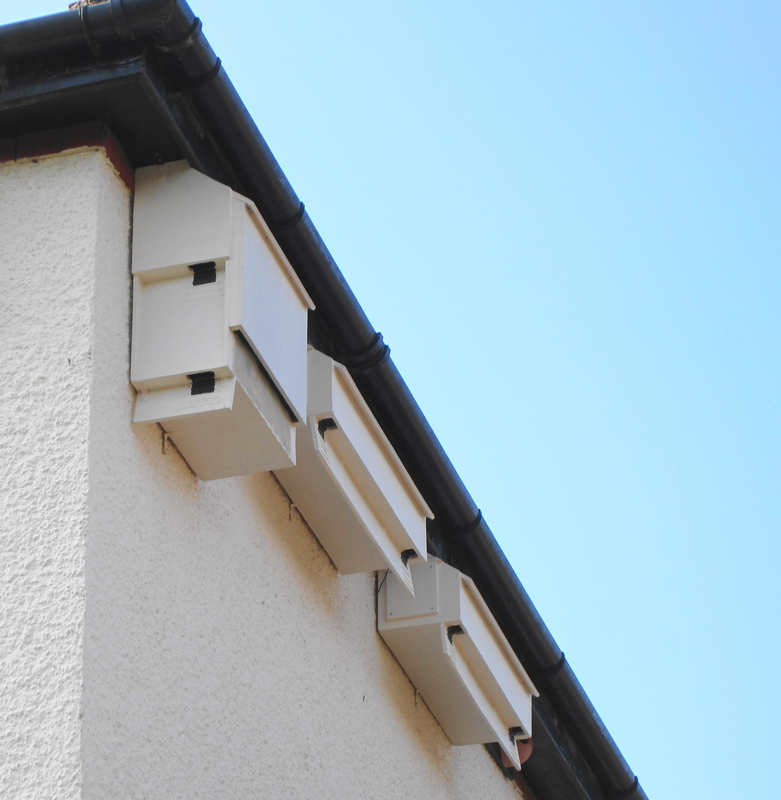 To anyone wanting to attract swifts to nest boxes on their property my best advice is to have a little patience. Install the best box design you can (doesn’t matter if it’s homemade or retail). Play swift attraction calls as loud as possible especially in the mornings, and if you are lucky swifts could take up residence almost immediately. However sometimes though (like me) it might take a little longer, but don’t give up in the meantime – keep on trying.